Despite the challenging legal and financial barriers facing community renewable energy, a surprising number of projects and project models have succeeded. These projects have brought together hundreds of people into ownership of renewable energy, often saving them money, and keeping more of the money they spend on energy in their own community. Below is part three of our Beyond Sharing Report, a report released in April 2016 about how community-owned renewable energy can capture renewables’ economic power. Be sure to read parts one and two. The models range from forming independent limited liability companies to municipal ownership to donations. Unfortunately, many are not easily replicable, taking advantage of unique circumstances from now-expired incentives to pro bono legal or financial expertise. But they illustrate the many ways communities can come together to take charge of their energy future. 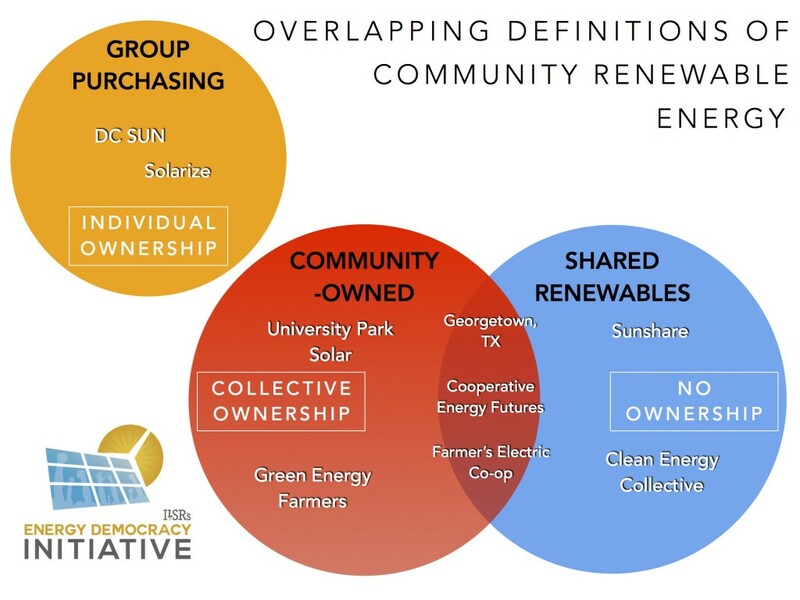 The following graphic illustrates the range of community renewable energy projects, on the basis of ownership, with examples drawn from the following pages. University Park Solar is a 35-member, private limited liability company in Maryland formed to share the economic benefits of electricity production from solar panels on the University Park Church of the Brethren started with the technical assistance of Community Power Network. The 23-kilowatt solar array cost $130,000 to install in 2010, financed with the purchase of shares by the 35 members, at $1,000 apiece. Electricity from the solar array serves 100% of the church’s electricity needs, with excess sold to the grid. In addition to federal and state tax incentives received at the time of construction (including a state grant), the community solar investors receive revenue from the sale of electricity to the church, to the grid, and the sale of the solar renewable energy certificates in the Maryland market (1 certificate for each megawatt-hour of electricity produced). Ongoing costs include panel maintenance, insurance, and bookkeeping. Through 2015, net of expenses, each member had recouped about 60% of their upfront investment. Although University Park Solar is a single project, it has inspired three other projects of similar design. Sun Harvester Community Solar LLC is a forthcoming project for an urban farm in Baltimore. It will not only generate revenue for members, but also make the farm carbon neutral. Greenbelt Community Solar is a 22-kilowatt solar array, producing power on the roof of and with electricity sold to the Greenbelt Baptist Church. The 34 members received nearly $11,000 from the state of Maryland and the 30% federal solar tax credit (in the form of a $34,000 grant) to reduce project costs. The project has ongoing revenue from electricity sales to the church ($3,800 in 2012) and from the sale of solar renewable energy credits in the Maryland market ($4,700 in 2012). Assuming a similar installed cost to University Park solar, the project will make back the upfront investment in about 10 years with electricity and credit sales. Community Solar Thermal is unique for selling therms rather than electric kilowatt-hours. It’s a 30-member effort to offset gas use at a local restaurant, selling therms at a 10% discount to the utility’s prices to the restaurant. The purchase agreement covers 13 years, and then the project will sell the equipment to the restaurant at 10% of the original cost. MinWind was one of the first successful community wind projects, but also serves as a cautionary tale for community ownership. The Minnesota-based 13.5-megawatt wind project was completed in two phases, attracting over 300 mostly local investors to put up $5,000 per share. Ownership was limited to Minnesota residents, but diversified with at least 85% from rural areas and a cap of 15% on the ownership share of any one investor. The 9-turbine project (each organized as an independent LLC) benefitted from a state wind production incentive of 1.5¢ per kilowatt-hour (paid over 10 years) and U.S. Department of Agriculture grants worth $178,000 apiece for the final 7 turbines. The option to capture the federal Production Tax Credit was passed through to individual owners based on their own tax liability (although ILSR’s research suggests few would have been able to fully use it). The project successfully generated revenue for nearly a decade without major incident, but the turbines were damaged in an ice storm in 2013, and the owners didn’t immediately have the capital to complete repairs. The financial shortfall became a crisis in 2014, when the Federal Energy Regulatory Commission informed the project owners that they were delinquent on filing eight years of reports required of “qualified facilities” under the 1978 PURPA. Under threat of $1.91 million in fines, the MinWind owners filed for bankruptcy in early 2015. The idea for Green Energy Farmers began back in 2007, when Randy Caviness had an idea to build two wind turbines for the rural electric cooperative serving nearby Iowa farming communities. With grants from the U.S. Department of Agriculture rural development program, 10-year Iowa production tax credits, and federal tax incentives taken as a cash grant, the two turbines were built by 2010. Seizing on a one-year extension of the cash grant program through 2011, Randy and his fellow energy farmers made plans to erect six more turbines, financed by 180 local investors. Shares in the projects were sold to friends and neighbors in the community. Most of the investors live within 30 miles of the turbines they own, and the dividends, tax-credits, and economic benefits remain in the community. The legal work was complicated, but not insurmountable. The state tax credits were capped at 2.5 megawatts, per owner, so each of the wind turbines are financed and owned by separate LLCs. Randy, along with local banks, was instrumental in setting up the financing schematics for all eight turbines. Each turbine provides revenue from tax incentives, land lease royalty payments, property taxes and dividends totaling $1.08 million annually over a period of 10 years. Unfortunately, the expiration of the federal cash grant means there are limited opportunities to replicate the projects. South Dakota Wind Partners took shape in the shadow of the rural cooperative Basin Electric‘s proposed wind farm near Crow Lake, SD, with local farmers and other South Dakotans interested in joining in. The result was a community-based carve out of the 100+ megawatt facility: 7 turbines owned by over 600 farmers and local residents, each investing $15,000 per share. The turbines were constructed as part of the larger wind farm, and the Wind Partners organization contracted with the cooperative electric utility for operations, maintenance, and purchase of the electricity. Like Green Energy Farmers, South Dakota Wind Partners was able to take the federal tax credits as a cash grant. Financial ownership took two forms: an equity share allowing the investor to share tax credits, and a debt share allowing the investor a fixed rate return on investment. Individual investors were aided by $80,000 in early seed money from four participating organizations: the local East River Electric Cooperative, the South Dakota Corn Utilization Council, South Dakota Farm Bureau and South Dakota Farmers Union. At least one other community wind project has been inspired by South Dakota Wind Partners. Black Oak Wind is a proposed 16-megawatt wind project in upstate New York, and currently has over 150 investors. Community Wind South is a 5% community owned, 95% developer owned 30-megawatt wind project in southwestern Minnesota. 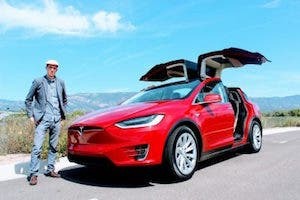 It raised over $3 million in community capital and uses a standard flip arrangement where an outside investor holds a controlling interest for several years. The project started in 2003, but was caught waiting for a 5-year resolution of cost allocation debate over expansion of transmission power lines for wind within the Midwest Independent System Operator. Finally, in 2011, investor Juwi purchased its share and some turbine components to make the project eligible for the expiring federal tax credit (available as a cash grant). Shares were sold to 28 landowners and nearby residents. Although successful, the project has faced a few challenges. Federal rules allow a clawback of the cash grant if there is too much participation from non-qualified investors. Additionally, local investors wanted specific financial benefits for the community (beyond the state’s production tax), but such benefits can’t be secured until the project flips to local ownership after year 6. Vineyard Power Cooperative is an interesting mix of electric cooperative working to develop renewable energy in a competitive electricity market. Most electric cooperatives have a monopoly service territory within which they serve all electric customers, but Vineyard is one of several choices available to customers on the small island of Martha’s Vineyard off of Cape Code, Massachusetts. It was incorporated in 2009 and now has over 1,300 members. The difference between Vineyard and other suppliers is that Vineyard customers are also members that will elect directors of the cooperative. The cooperative has developed about 300 kilowatts of solar projects on parking lots and capped landfills, and aspires to develop offshore wind. Like other suppliers, it can purchase power on the wholesale market when it’s own projects aren’t generating sufficient power for its customers. Collective ownership of renewable energy doesn’t have to be one-off or small scale. Cities have a long history of being energy providers to their residents and businesses, with over 2,000 municipal electric utilities. A few of these city-owned utilities have invested heavily in renewable energy resources. Georgetown, TX, recently made headlines when it contracted to get 100% of its electricity supply from wind and solar energy, with plans to sell excess generation to the Texas electric grid. The wind power will come from a share of a new wind power plant being constructed near Amarillo and the solar energy will be supplied by a new 150 MW solar project being built by SunEdison in 2016. Just 4 hours up I-35, the municipal utility in Denton, TX, has already reached 40% renewable energy in its supply through a 60 MW wind power project 30 miles north of town. In late 2015, the city announced plans to acquire part of a new solar power facility to increase the share of renewables to 70% of the electricity supply. 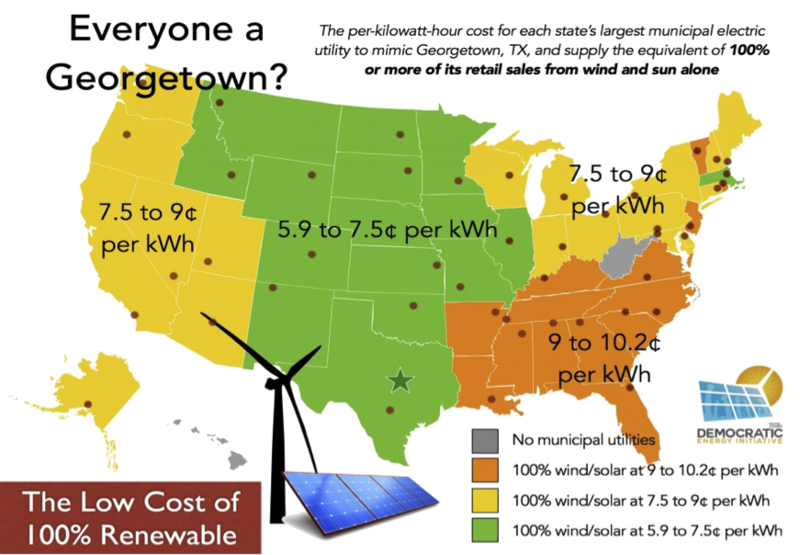 The following map was inspired by Georgetown, TX, and looks at the approximate cost for municipal utilities to purchase solely wind and solar electricity for their municipal grids. Municipal utilities can also pool their resources to own energy generation. Currently, most municipal utilities source their energy from jointly-owned municipal power agencies (such as Wisconsin Public Power Inc. Energy) or federal power agencies (such as the Tennessee Valley Authority). Power from either is typical sourced from aging fossil fuel-fired power plants, nuclear power plants, and hydro dams. But municipal utilities can also team up to purchase renewable energy. The Berkshire Wind project, for example, is a cooperative 15-megawatt wind power project owned by a municipal power agency and 14 additional municipal utilities. The Kimball Wind Project near Lincoln, NE, provides 10.5 MW of wind power for the 57 communities represented by the municipal power agency. The Delaware Municipal Electric Corporation has installed almost half the state’s 58 megawatts of solar capacity on behalf of its municipal members, and the Indiana Municipal Power Agency has also installed several solar farms. While cities can be more responsive to local demands for renewable energy, they also operate at the same disadvantage as cooperatives, unable to use federal tax incentives for renewable energy. 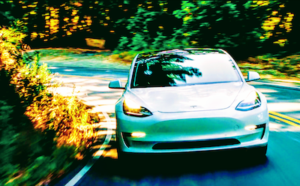 And although some prominent exceptions have been noted, most municipal utilities or their power agencies have procured little more clean energy than what is required by state law, despite it being very cost effective. Cities without municipal utilities have to be more creative in their pursuit of clean energy. In six states (and a pilot in a seventh), a policy called community choice aggregation allows local governments (or groups of local governments) to join together to make energy purchasing decisions on behalf of residential and small business customers in their community. In practice, it means that cities can choose their energy suppliers on the basis of cost, pollution, and local economic benefits, without having to own and maintain the electric grid. In most states, local aggregation has little to do with clean energy, but gives cities purchasing power to procure electricity at lower prices. In California, however, local energy choice is being deployed much as its forebears had hoped. Marin Clean Energy, launched in 2011 after a 10-year and multi-million-dollar battle with the incumbent electric utility. Through its purchasing power, the aggregation of several cities and counties north of San Francisco was able to procure electricity supply that was 27% renewable at comparable price to the half-as-renewable electricity available from incumbent Pacific Gas & Electric. Although a small part of its portfolio so far, the local utility is using funds from a green pricing program to help with pre-development of local solar projects, has signed contracts for several other small wholesale solar projects, and offered a solar feed-in tariff. Sonoma Clean Power serves communities in Sonoma County, Marin’s northern neighbor. 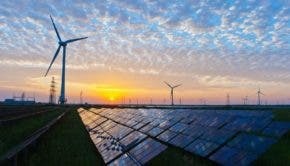 Launched in 2014 with 20,000 customers, the local utility will offer a default supply of 33% renewable electricity (50% greater than the incumbent utility) at a lower rate. The power option was made possible in part by a geothermal power plant able to provide 15% of the utility’s needs, but the utility is also offering a price premium on net metering for excess power production and a feed-in tariff to procure more local solar energy. The city of Lancaster has plans to launch its aggregation soon, and the city of San Diego, San Francisco and Alameda County (among others) are investigating. Unfortunately, expansion of community choice aggregation is likely limited, as it is viewed by most electric utilities as a competitive threat. It took nearly a decade from the time the policy was authorized for Marin Clean Energy to launch its energy services, for example, due to millions of dollars incumbent Pacific Gas & Electric spent lobbying to undermine the local aggregation. Municipalities don’t have to own a utility to develop renewable energy projects, although they may be limited by laws granting utilities exclusive rights to serve local customers. As shown in our recent Public Rooftop Revolution report, major cities in 25 states could host nearly 5 gigawatts of solar power on municipal property, at minimal cost. And there are several other prominent examples of municipal activity on renewable energy. In St. Paul, MN, the city partnered with nonprofit organizations and the downtown business district to create a hot water district heating system. In the decades since the 1983 demonstration project, the system has grown, incorporated cooling as well as heating, and is now primarily powered by a steam plant fueled with urban wood waste, generating heat and electricity. In New Bedford, MA, the city contracted with a solar company to provide solar electricity from municipal rooftops and nearby solar arrays. 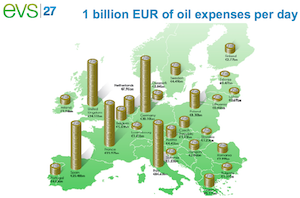 The investment saves $6 to 7 million per year on electricity expenses. In Lancaster, CA, the city similarly contracted with a third party to install 9 megawatts of solar, enough to serve electricity demands of all its schools and 90% of use for five municipal buildings. The city is also investigating forming a local energy aggregation. In West Union, IA, a revitalization plan for downtown included a district geothermal loop system to provide heating and cooling for commercial businesses. The city formed a separate limited liability company to manage the system, which has successfully connected about 20 businesses (of a potential 60). The company is leasing the system from the city for five years, after which the city may take control of management. The wide range of structures and benefits suggests a need for core principles for community renewable energy projects. 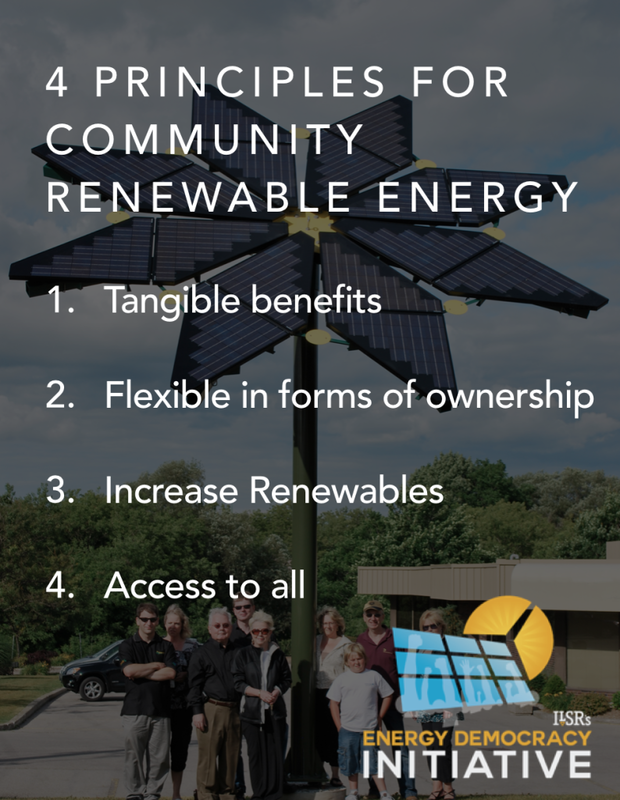 ILSR and many allies working on community solar have adopted four key principles: tangible economic benefits for participants, flexibility in project design and ownership, additive clean energy, and access to all customers. 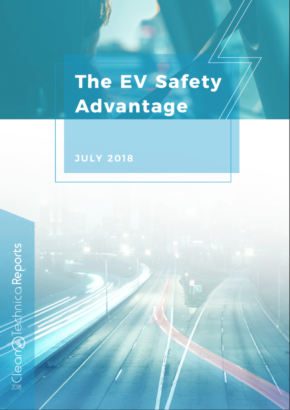 Tangible benefits mean that customers should see energy savings or profits commensurate with their level of risk and the benefits of distributed clean energy (such as fixed fuel costs and minimal losses in transmission). In Minnesota’s community solar program, for example, participants receive bill credits worth about 14¢ per kilowatt-hour, 2¢ premium more than they are paying for electricity. In Massachusetts, virtual net metering means customers subscribing to solar will get the same value in bill credits as those with a solar array on their own rooftop. 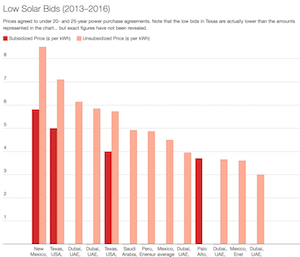 In contrast, California utilities allow customers to “subscribe” to solar projects at a premium of 15 to 35% more than they would pay for regular electricity. In Washington, DC, the Public Service Commission set a bill credit rate for community solar subscriptions at about half the rate folks with solar on their rooftops receive. These are poorly designed community energy programs. Flexibility means that there should be many forms of project ownership, including options for and even encouragement of non-utility and community ownership. 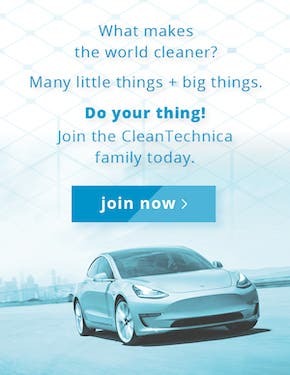 The Additive principle means that community or shared solar programs should not be used to shift customers away from self-generation. For example, two utilities in Arizona, Tucson Electric Power and Arizona Public Service, have introduced utility-owned distributed solar programs while also lobbying the state Commission to reduce compensation for net metering customers. Access means that shared solar should be available to electric customers regardless of race or income. Given historical disparities, this means policy makers must require utilities and community solar market participants to make proactive efforts to reach historically marginalized customers, especially people of color and those on low-income energy assistance. The federal government can allow energy assistance dollars to be redirected into long-term bill reduction through community solar. Cities, utilities, and shared solar developers can identify ways to extend financing to customers with otherwise higher credit risk, including on-bill repayment programs such as rural electric cooperatives are using for energy efficiency. GRID Alternatives, a nonprofit organization based in Colorado, has shown how community solar can have a double benefit to low-income communities by providing jobs and energy savings for those communities. Grand Valley Power is just one of dozens of projects (comprising nearly 20 megawatts) that the organization has developed. Community renewable energy is decades old, but the opportunity for growth is now. Dramatically falling costs have made shares of clean energy projects affordable for many Americans, subscriber models have removed much of the risk, and financing has made participation easier than ever. Given the challenges, a surprising number of enterprising models have emerged for community-owned renewable energy. The barriers are falling or being evaded. Federal tax incentives can be accessed through third parties and subscriber models. The scheduled expiration of the federal tax credits will drive more potential lenders to support development models that don’t rely on tax equity. Federal and state crowdfunding laws offer new safe harbors for community-based projects to raise capital from their neighbors. Cooperatives, popular in food and other sectors, may yet become a tool for capturing more local economic benefits of renewable energy. Municipal and local energy aggregation offers new local authority over energy purchasing, and can drive greater local ownership of renewable energy. New community solar (and potentially community renewable) policies and virtual net metering can expand access to solar for those without a sunny rooftop. The view isn’t entirely rosy. Utilities have fought back against net metering rules and reduced compensation for solar owners, and some utility “community solar” programs seem to be a harmony to the anti-solar melody by reducing the benefits of going solar. Subscription models also reduce community control, shrinking the opportunity to use community energy projects to accomplish social goals such as quality employment for disadvantaged populations. Low-income folks still struggle to access shared renewable energy just as they have individually owned systems, and policies continue to erect financial barriers. Finally, community solar has been a stand-in for community renewable energy, which should be broadened to include all renewable energy technologies. But community renewable energy is growing and it’s a remarkable opportunity to re-localize the economic benefits of and control over the electricity system. The policies to enable it are just beginning to grow and we have the opportunity to make sure they uphold the best principles of community-centered, community-owned, and distributed power. Full report available at ilsr.org. For timely updates, follow John Farrell on Twitter or get the Energy Democracy weekly update. Be sure to read parts one and two.